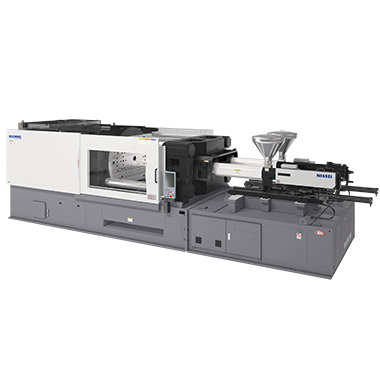 Hybrid 2-color/dissimilar material molding machines｜Products Information｜NISSEI PLASTIC INDUSTRIAL CO., LTD.
DCX-III Series is equipped with NISSEI’s original 2-piston type clamping mechanism, which transmits ideal clamping force to both sides of molds. High-performance High-functioning controller TACT IV achieves faster control and improves repeatability. The newly-developed servo-driven rotation mechanism achieves high-speed and shockless mold reversing motion (reversing time: about ½ of the conventional machines). 2-color/dissimilar material molded products have been widely used for automotive interior/exterior, industrial parts, and household goods. NISSEI double-injection molding machines can mold high design-ability and functionality products in one process cycle. Inner mold assembly (integrated molding) can reduce assembly processes, number of components, and cycle time as well as saving mold costs and floor space. NISSEI double-injection molding machines remarkably rationalize production processes while adding high-values to the products.